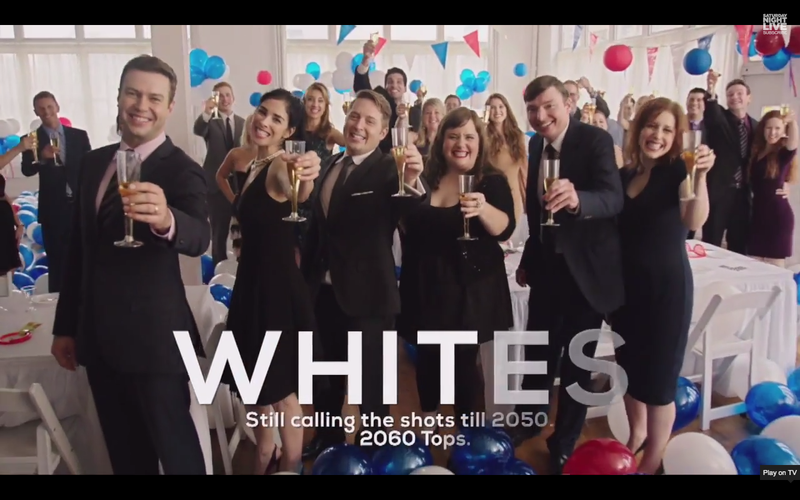 “Whites.” I’m going to have to go with “Whites.” A ridiculously outlandish sketch that I never would’ve expected from this show. It’s nice to know that there’s still a little bit of comedic edge to the proceedings here at SNL, and a sketch like this really elevated the episode for me, especially with lines like “For these final years of white dominance, we’re gonna soak it all in.” Jesus, what a great damn sketch. I have to go with the weird sketch set on the River Cruise. None of the jokes really worked for me, honestly. The premise was super thin, and you could see where things were going from a mile away. An extremely lazy and phoned-in sketch. This was really the only sketch tonight that had zero redeeming qualities, so that’s saying something I guess. -Really great use of Bobby Moynihan to elevate otherwise mediocre sketches. His Benjamin Franklin was the saving grace of the Joan Rivers Heaven Sketch, and his “reveal” in the Proposal sketch was priceless. I’m glad that he made some wonderful appearances tonight. -LOTS of Kenan Thompson in the first half of the evening. My favorite was his performance as Reese De What in the “Forgotten TV Gems” sketch, which probably comes in as a close second for Best Sketch of the Night. Kenan has a great sense of playing the oddball and the confusion of a sketch. It’s a delight to watch, and he made that sketch greater than it already was. Not great, but better! As per the general theme of the night. Michael Che was certainly more comfortable this week, and got some great jokes in (“Who goes to Texas AND Africa?”). The Al Sharpton section wasn’t too strong, honestly, but I enjoyed Kate McKinnon and Sarah Silverman’s band, Garbage and Her. It was a great silly song and it added some ridiculousness to the night. I also enjoyed the cute little rapport between Colin and Michael about what words/terms each of them can and can’t say. They’re getting better slowly but surely, I can sense it. Not much to say about Maroon 5. Another excuse to let a musician invade a bunch of sketches. -The cold open sketch was fine, some humorous jokes here and there. Jay Pharoah’s Obama impression felt a bit off tonight, maybe that was just me. -Seriously, I loved Benjamin Franklin laughing at these jokes with a complete misunderstanding of their true meaning. -A classic Ron Burgundy-esque moment when Kenan as Al Sharpton said to Colin during Weekend Update, “Who tells the jokes,” as a question, rather than a statement. -The Bennett/Mooney sketch was very strange. I liked it though, as I do most of their work. This entry was posted in SNL Recap. Bookmark the permalink.